Metric hex nut dimensions sizes chart according to ISO 4032. All dimensions are given in millimeters. 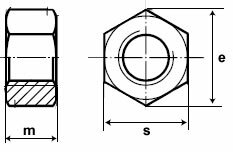 Width across flats (wrench size) and corners, nut height (thickness) and thread pitch dimensions are given for nut sizes between M1.6 to M64. Metric hex nut dimensions calculator Calculator form of the metric hex nut dimensions chart.